L’été indien à New York pour une expo qui nous ressemble ? "In Between & Outside is a series of portraits by Sara Swaty exploring gender identity and the body across a broad spectrum of individuals. The works were created with an interest in how cultural preconceptions about gender have created unattainable ideals about masculinity and femininity. 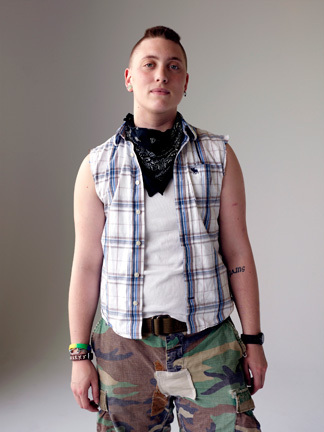 Subjects range from those born into a gender they do not identify with, to transgender individuals who have physically transitioned and changed their bodies. The images aim to share the personal stories of a gender variant community while challenging stereotypes that LGBT communities face." "Sara Swaty is a Los Angeles based photographer who was born and raised in Saint Louis, Missouri. She studied photography at Rochester Institute of Technology in New York, where she honed her skills in lighting and crafting images from concepts. 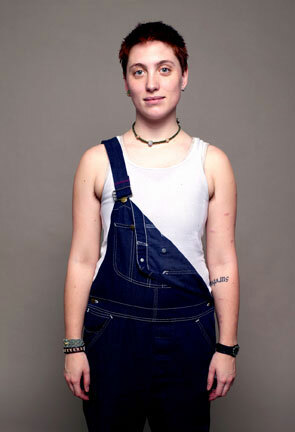 In the spring of 2010, Swaty began a project focused on gender expression, which led her to photograph individuals within both straight and LGBT communities in an effort to capture images that question traditional gender roles and explore identities beyond the male-female binary. This photographic social commentary includes people from coast to coast, including New York, Missouri, and California. In all of her projects, Sara strives to create work that offers viewers new perspectives on social expectations and restraints within their cultural contexts. You can view her work at saraswatyphoto.com." "The concept of gender roles, responsibilities, and associated expectations has fascinated me for years. This photographic commentary began as an effort to analyze gender norms, and how these norms can be altered in the quest for a self-defined ideal. The project expanded to explore the range of identities that individuals embody along a masculine-feminine and male-female continuum. In Between & Outside aims to raise questions for the viewer within the context of each individual’s experience. What does it mean to be masculine or feminine ? To be a man or a woman ? Do these definitions change over time ? The subjects of the photographs share a common openness by expressing their gender in ways that transcend traditional gender roles. "